Little Miss A started gym classes in April in the Gym Stars programme which is operated by Total Gymastics, a company set-up by Olympic Bronze Medallist Beth Tweddle MBE. She used to go to gym classes in Aylesbury where we used to live and always enjoyed it. It's good for her to have a focused weekly session that uses up some of her unending energy! The classes appear much more structured than her previous ones but this hasn't daunted her despite her only just turning 4 when she started. Working towards badges has definitely taught her about the need to practice and patience. When she first started classes she used to constantly ask when she'd get a badge so we used to talk about trying really hard and practicing what she was doing in class. Now she understands a lot more that she's working towards getting each badge. 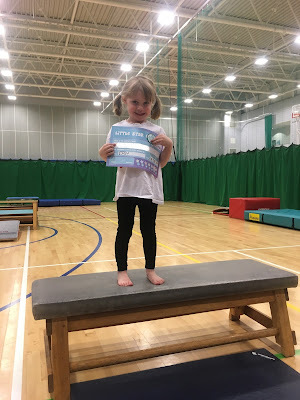 It helps that with Gym Stars each child has a booklet with what they need to do for the next badge and they get ticks and stars when they achieve them. This was her getting her first badge with Gym Stars. Little Miss A took part in her first gym routine recently as well. It was great to see her really concentrating on each move and being part of this as a group. Proud Mummy moment! At the end of each term the kids get to show off their skills to the parents on the equipment. It gives us the chance to see what they've been working on and take photos! I recently did an interview with Total Gymnastics if you'd like a read. 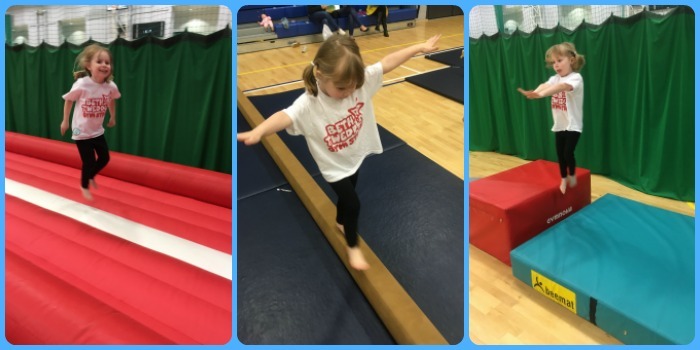 Their Gym Stars programme is aimed at children aged 2 to 7 years and classes operate throughout the North East. Take a look at the Total Gymnastics website for more details.